Paul McDougall, Google - Microsoft has built its new Windows 7 operating system with an eye toward simplicity and efficiency. Gone, among other things, are Vista's intrusive security queries that seek verification for even the most routine tasks. But that doesn't mean Microsoft's next OS won't present a learning curve. According to Microsoft's Brandon Paddock, Windows 7 comes with no less than 21 new hotkey combinations. They could ultimately make life easier for users, but they'll take some time to master. Some of the new hotkeys should simplify desktop navigation, Paddock writes on his blog. For instance, Win+Space provides an immediate peek at the desktop. Win+Up maximizes a window, Win+Down restores and minimizes a window, and Win++ zooms in on a page. There are also hotkey combinations designed for users of multiple display devices. Win+Shift+Left jumps to the left monitor; Win+Shift+Right forces a jump to the right monitor. Win+P offers a look at all external display options. And there's a new hotkey combo that works with the Internet Explorer Web browser. Alt+P toggles the Preview Pane on and off. A full list of all the new hotkey combinations in Windows 7, including some Taskbar controls, can be found here. 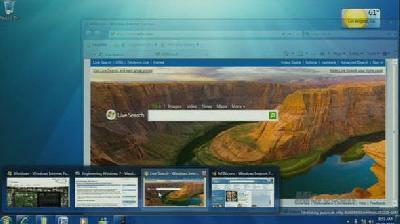 A beta version of Windows 7 is now available to the general public via a download from Microsoft's Web site. Microsoft needs Windows 7 to be a hit. Vista, the current version of Windows, has failed to catch on with mainstream computer users and businesses have shunned it outright. Many users have complained about Vista's hardware requirements, intrusive security measures, and lack of compatibility with older applications. Dissatisfaction with Vista has allowed Apple to gain share against Microsoft in the computer operating system market in recent months. Windows' market share in November fell below 90% for the first time in years, while Mac OS is flirting with the 10% mark, according to market watcher Net Applications. Microsoft is hoping that Windows 7, which is expected to be released in its final form in late 2009 or early 2010, will reverse the trend.